How Long Does It Take for My Ball Python to Shed? The ball python in your home terrarium is a long way from his native Africa. Despite the distance and change in habitat, some things don't change. If he's healthy and growing, he'll shed his skin periodically. Shedding, formally known as ecdysis, can be a time-consuming process, occasionally requiring a bit of your assistance. Even if you find snakes a bit frightening, take a moment to look at the ball python (also known as the royal python, as reflected in his scientific name, Python regius). Though he's not a big, imposing snake, he's handsomely marked, showing brown and light-brown markings on his substantial body. These allow him to blend in with his native habitat, in the grasslands and savannas of central and west Africa. Whether he's in his native home or living in your den, he will molt periodically, a process that can take a week or more from start to finish. 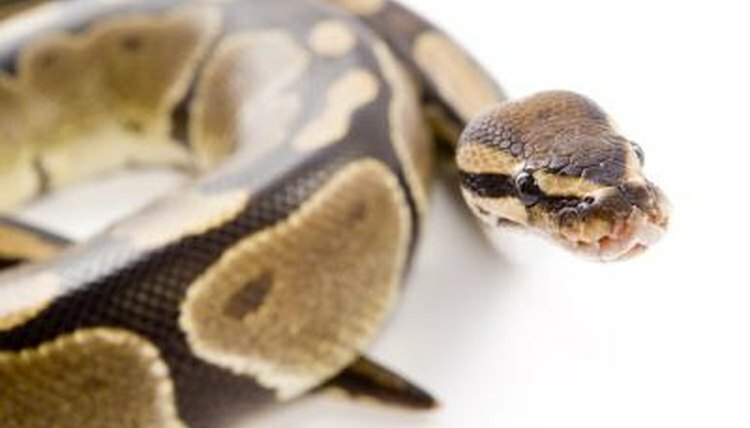 Shedding serves two purposes for the ball python: his new skin provides him room to grow as well as a better moisture barrier than his old skin. Of course a young, growing python will shed more often than an adult will, and the season can affect the shedding schedule. A python who is eating regularly and living in a warm environment sheds about every four to six weeks. In the wild, a python who hibernates or is less active in the colder months will shed only about once during the winter. The ball python gives fair warning when he's ready to shed. About a week before he's ready to get rid of his old skin, his colors will fade and his stomach will look pink, instead of its normal creamy color. He'll take on a dull grayish or silvery sheen and his eyes will begin to dull as well. They will take on a blue, milky appearance for a few days; about 36 hours before he molts his eyes will become clear again. When it's time to molt, the ball python will begin to rub back his old skin, starting with his nose. He'll press himself against whatever furnishings are in his cage to help the shedding process. Usually the old skin will catch on something and he'll slither out of it, leaving his old self behind. You can discard his old skin when he's finished. When he's finished shedding, examine him to ensure all his old skin has been removed, paying special attention to the tip of his tail and eye caps. Old skin left behind can host infection. If your python has skin left behind, or is having some problems with the shedding process, you can lend a hand. Put your snake in a damp cloth bag or pillowcase, tie it shut and place the bag in a tub under a heat lamp for up to two hours. When he emerges, the remaining skin should be gone. A second alternative is to fill his habitat with damp towels and leave him overnight -- with a temperature between 82 and 88 degrees Fahrenheit -- to help loosen the old skin for shedding. If you aren't able to help him lose his skin, consult a vet. How to Tell If a Guinea Pig Is Dehydrated? How Long Does a Corn Snake Grow Before It Sheds Its Skin? When Do Garter Snakes Shed Skin?